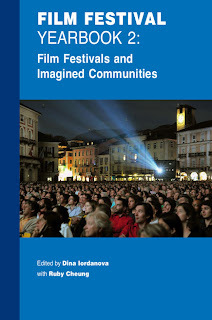 I am pleased to announce the publication of Film Festival Yearbook 2: Film Festivals and Imagined Communities, edited by Dina Iordanova with Ruby Cheung, published by University of St. Andrews Film Studies in conjunction with their Dynamics of World Cinema project. The book is the second in the series; the first volume, the Film Festival Yearbook 1: The Festival Circuit, was published in 2009. I'm pleased—not only because I was invited to contribute my essay "Diasporas by the Bay: Two Asian Film Festivals in San Francisco"—but, primarily, because my essay promotes two of my favorite film festivals in the San Francisco Bay Area: the San Francisco International Asian American Film Festival and the 3rd i Film Festival. As the publishers have synopsized: Film Festivals and Imagined Communities, the second volume in the Film Festival Yearbook series, brings together essays about festivals that use international cinema to mediate the creation of transnational "imagined communities". There are texts about the cultural policies and funding models linked to these festivals, as well as analysis of programming practices linked to these often highly politicized events. The case studies discuss diaspora-linked festivals that take place in Vienna, San Francisco, San Sebastian, Havana, Bradford, Sahara, South Korea, and London and that feature cinema from places as diverse as Nepal and Kurdistan, Africa and Latin America. Authors include Lindiwe Dovey, Ruby Cheung, Michael Guillén, Jérôme Segal, Miriam Ross, Roy Stafford, Yun Mi Hwang, Isabel Santaolalla and Stefan Simanowitz, Mustafa Gündoğdu, and Dina Iordanova. The Resources section features an up-to-date bibliography on film festival scholarship (by Skadi Loist and Marijke de Valck) and an extensive thematically-organized listing of a variety of transnational festivals. Dina Iordanova has offered the volume's contents at her own site DinaView. Jonathan Rosenbaum has written: "The very ambitious aspiration of the Film Festival Yearbook is, quite literally, to define a new area of film study. Part of the implied agenda of the book, given the scope and seriousness of the aspiration, is to combine some of the best and most valuable features of scholarly rigor with some of the most valuable features of journalism. The book can be useful to potential and actual film festival programmers as well as to academics who are studying film festivals as a social phenomenon. Filmgoers with particular interests of their own as well as those who are invested in specific national or ethnic groups will also be attracted to this volume." Faye Ginsburg, Director of the Center for Media, Culture and History at New York University has written: "Film Festivals and Imagined Communities—the second volume in the series—opens up new horizons both for those who study media and those who create the significant but often overlooked "media worlds" where films first get launched: film festivals from the "periphery". Anyone who has attended or helped run one knows the intensity and significance of these distinctive social arenas in calling attention to new work as well as to emergent cultural possibilities. This excellent collection clarifies the role that film festivals play as venues that constitute a social universe for diverse groups, audiences, and artists (diasporic, indigenous, LGBT, migrant workers). With articles addressing how these festivals work—from the economic and artistic considerations of those who produce them to the way they help to 'imagine communities'—we start to understand the role these festivals play for members of minority communities that too rarely see cinematic work related to their lives. This collection is indispensable for anyone interested in understanding contemporary global media and what makes it work." Finally, of related interest, is a recently-published article by Konrad Ng (University of Hawaii, Mānoa)—"Thoughts from Oslo, Norway: Film Festivals and Expanding the Moral Imagination"—published at FlowTV. In his article Ng aligns certain lines of reasoning from President Obama's acceptance speech for the Nobel Peace Prize with cinema, especially with regard to "the continued expansion of our moral imagination; an insistence that there's something irreducible that we all share." Following this line of reasoning, Ng proposes that film festivals can serve as a "model of engagement that may help expand our moral imagination." 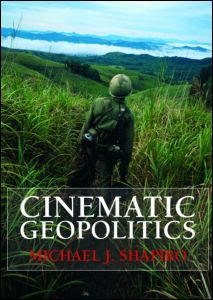 Citing Michael Shapiro's Cinematic Geopolitics, Ng suggests that "film festivals can be a space for envisioning possibility and articulating critical attitudes towards acts of violence and oppression; film festivals can 'provide a venue for films with significant anti-violence and anti-war themes and cinematic styles' and by doing so, assist the expansion of the moral imagination." By way of case study, Ng takes a look at how grassroots Asian American film festivals such as the Los Angeles Pacific Film Festival (sponsored by Visual Communications), and the International Asian American Film Festivals in both New York (sponsored by Asian CineVision) and San Francisco (sponsored by CAAM) contribute "a critical role in translating and transforming a notion of community into cultural and political engagement." CAAM's Executive Director Stephen Gong acknowledges Ng's thesis as "provocative and convincing" and states: "There are many kinds of film festival, [of] course. Some of the largest are integral to the marketing and distribution of cinema as entertainment. Some at the other end are more geared toward civic boosterism. Our sector, and one shared by dozens, if not hundreds of other culturally specific festivals, reflect, as Konrad asserts, an important connection to a cultural or identity-community, and as such, play a key role in the continued evolution of the community and its place within the larger world." 06/02/10 UPDATE: I'm so pleased that the Film Festival Yearbooks are receiving some coverage in film journals. Adam Nayman's review for the current issue of Cineaste surveys both volumes, along with On Film Festivals—the third edition of the Dekalog series guest edited by Cineaste staffer Richard Porton. Nayman has been especially kind to me. He writes: "This plurality of voices extends also to FFY2, which gestures towards the margins of the international film festival network, focusing on festivals geared towards different ethnicities and social groups. It's heartening, for instance, to see a piece written by somebody best known as a blogger—Twitch.com critic Michael Guillén, whose 'Diasporas By the Bay' patiently explicates the ways in which two San Francisco-based initiatives—the San Francisco International Asian American Film Festival and the San Francisco South Asian International Film Festival—have thrived by matching "content to constituency." Thanks for the shout out, Adam!